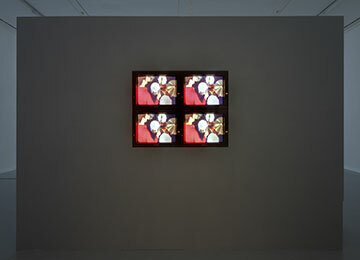 The exhibition consists of five oversized suitcases and a two channel video installation. In a personal way, all the works reflect upon and relate to places, travelling, origin and nostalgia. Every suitcase hosts a miniature art exhibition space inside. Suitcase 1 shows an installation with an animation, “The warmest winter in 250 years”. Suitcase 2 shows another animation, “The tallest mountain in Europe”. Suitcase 3 shows another animation, “The city I live in”. Suitcase 4 shows yet another animation, “All the dead I’ve seen”. Suitcase 5 shows a photo exhibition entitled “Airport chapels”. It is a series of architecture documentation, documenting airport chapels – the prayer or meditation rooms that are to be found in most international airports. Also included is “The trip to America”, a slideshow with narration. Finally, a two channel video installation is completing the show. It is “Immigrant Song”, in which, on one screem, Berlin-based drummer Hannes Lingens plays a variation of the drum groove from Led Zeppelin’s “Immigrant Song” using firework rockets as drumsticks. On the other screen fireworks on a night sky go off in synchronization with the drumbeats from the first screen.